Published March 24th, 2008	in Deal Site Reviews. 14 Comments	Tags: RetailMeNot, TechCrunch. Now let’s go back to last Monday’s announcement about the “Community” launch and associated discussions. The TechCrunch story includes a demo video which is about 5 minutes long, with Guy King of RMN. As I was watching the demo, I strongly felt like I have seen this “community” platform somewhere and on digging my bookmarks, it was from socialengine.net. Literally, nothing but a downloaded script, very minimally modified. However for someone watching the video on TechCrunch, Guy King makes it sound like a home grown script and never utters a word about actually buying it. I am not even sure why there needs to be a launch for it. It is just a downloaded script which is being put out in the site to see if it helps them. There is definitely nothing wrong in buying a script (that is for what they are made for), but a 5 minute interview about the script and RMN making it sound like built at home was really silly. Today going back to TechCrunch to read more comments, this (about socialengine.net) has been discussed in the comments as well. Also there is a message (#35) about coupons for certain merchants being blocked. Digging (Googling) more into it, there are about 125 merchants, for whom RetailMeNot does not have any real coupon, but has pretentious links, which make you think that you are getting a discount, but all that you (user) do is, help them earn a commission and nothing else. See this page for an example: http://www.retailmenot.com/view/netflix.com (do not forget to read the comments for the 2 “featured discounts”). In my view this is nothing but just a “rip off”. The introduction of this Community network concept is to “expand” the existing community. To see how big a community they have, I checked their forums; they have 1984 members, with only 16 members having more than 4 posts! So there is no real community, but coupon ratings has been successful as there is no need to log in/sign up to rate a coupon and it does not really consume any time to click that single button. On the whole, RMN has one strong point - RATED COUPONS and other than that, everything else surrounding RMN is just a buzz. Lots of coupon sites have ratings. I think you’ve missed the point with what makes retailmenot so good- the quantity of coupons they have plus it’s actually a really nice site to use. As the manager of another coupon site (http://www.shoppingbargains.com) I have been frustrated to find ours and other exclusive coupons posted on RMN, especially in their early days. Ratings are great; however, if no quality control or testing exists in the first place or is done prior to posting then shoppers are swimming completely at their own risk. The potential exists for many to be burned before sufficient ratings have been tallied to warn those who come later. I am afraid the opposite is true. Shoppers aren’t afraid to burn or the site wouldn’t be so popular. You can’t copyright a number which is what a coupon essentially is. Coupons are and will be exchanged on the net and honestly I don’t see how posting a coupon on RMN goes much beyond of me telling my friends about it in person. The old business models no longer work. Newspapers can’t charge for the online content. Music labels are struggling with DRM. Maybe affiliate marketers need to re-think their business as well. Just think what happens if Google picks up the idea and introduces “coupon:” as a search operand similar to “define:” or “stocks:”. Tom – You touched an area, which I did not really want to discuss as a part of my original write up due to some heavy guessings involved. However I did mention that RMN has about 13,000 merchants and 71,000 coupons. We know that practically there is no single source for coupons (for the coupon sites). Coupon sites need to search the internet big time, subscribe to tonnes of newsletters etc, check advertisements and so on. With RMN highlighting operating with just 3 employees, it is obvious that, not all coupons are collected by the employees. Also from my statistics from their forums, we see that there is no real community there and nor is there any reward for submitting coupons. So, my best guess is, most of the coupons are got using screen scrapping scripts (extracting from other coupon sites) and maintaining the quality is done by the users. 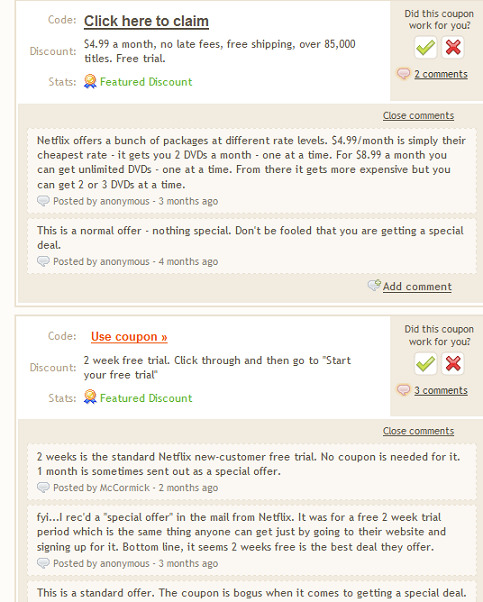 That is why my appreciation has been more towards the users who rate the coupons than the quantity there. I undoubtedly do acknowledge that their site is well designed, that is my very first line in the review. Now that they have introduced the “community” and are going to attribute coupon submissions to the actual submitters, in the coming months we can analyze to see how many “real” users are submitting coupons. Good point about burning bad sites, Yan. I think RMN gets some slack from shoppers because their coupons are posted by a community and thus the community knows that errors will be part of the mix. As for Google creating a search operand, that would not be the same as republishing exclusive coupon codes since the search results would still link to my or another coupon site. I see no problem with that and would probably welcome such an operand if it were open. Paul, good guessing! Having run ShoppingBargains.com for 9+ years and knowing many friendly “competitors” within the industry, it’s clear to me that 3 people cannot manually enter and keep up with 13K merchants and 70K+ coupons. All the big players I know still do lots of manual coupon entry and quality checking. As for community involvement, knowing it’s hard to start and maintain a vibrant community, I’d be surprised if more than 5% of RMN’s coupons were posted by a real community of individual users. The coupons are entered through the toolbar, so that is why you do not see activity in the forums. Just like there other tool bugmenot. I don’t think RMN does any scraping. I know about their other sites and the software they use and it’s all very simple software. I just don’t think they’ve got the technical know-how to implement efficient scrapers. They have a strong foundation in user submitted content with their bugmenot site, so they were able to leverage that community to get RMN going. While their model is very controversial from an affiliate standpoint, consumers seem to love them. So this may just be an industry disruption that is here to stay. It’s up to the merchants to decide if they want to pay RMN commissions and whether they want to be listed at all. If enough of the big merchants say “remove me” they will no longer have any value. So it’s definitely in RMN’s interest to cater to merchants and offer them valuable customers. I don’t buy the argument stating that RMN is not responsible for the quality of the coupons that their user’s submit. A quality assurance team could be put in place to validate the authenticity of coupons in conjunction with the feedback they receive from their users. How can RMN justify wasting time verifying every coupon submitted? That sounds like a big old waste of time and expense. I wonder how much moola RMN actually make to sustain paying 3 people to run the business, if it is a business? RMN has been in trouble for this before. They have been outted on several affiliate marketing forums for posting exclusive coupons. What everyone may not know is that many of the exclusive coupons are now being credited to the site it was issued to rather than credit being based on the site it was referred from (RMN). Once the coupon code is entered, it nulls the referrer(RMN)and credit is then appropriately assigned to the intended website it was stolen from. If more merchants would track thier coupons in this fashon, nobody would complain and RMN would just be helping rather than hurting other coupon sites commissions. Not THAT would be the test of RMN actual business model. I really believe that it is a very time consuming process to have to verify the coupons continuously. One main reason is that the manufacturers retains control when to terminate the promotion or discounts and at any one time a valid coupon may become invalid (well, except those that have specific expiration dates). The way RMN operates, they rely on the consumers to rate the coupons and based on what I have seen, many of those RMN coupons have very low percentage of success. Fortunately people have now started to understand how RMN is useless 99% of the time. Their codes are never updated, whenever they are real, otherwise they just scraped them from other sites which is the core competency of the company. Additionally, they spam search engines (look at their HTML and tell me where the H tags are) but for sure they have money. VERY fortunatelly the UK internet advertising bureau found out all of the RMN tricks and decided to ban them nationwide. A good move for a cheating company made of tricks dedicated to fool journalists and basic users into cliking for cookie stuffing. The problem with exclusive coupons is that others will inevitably pick up your content. It’s hard to get the SMB’s to post their coupons on your site, so you are left with affiliate models and partnerships.